Earth is on track to sail past the two degree Celsius (3.6 degrees Fahrenheit) threshold for dangerous global warming by 2050, seven of the world's top climate scientists warned Thursday. 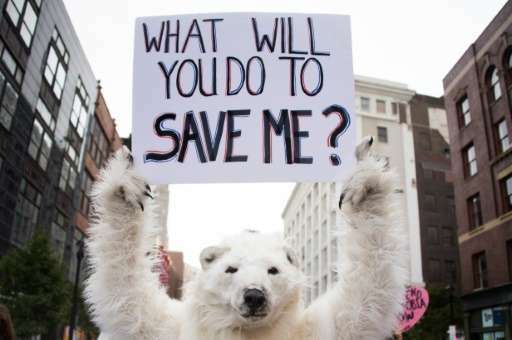 "Climate change is happening now, and much faster than anticipated," said Sir Robert Watson, former head of the UN's Intergovernmental Panel for Climate Change (IPCC), the body charged with distilling climate science for policy makers. Since 1990, devastating weather-related events—floods, drought, more intense storms, heat waves and wild fires—due to climate change have doubled in number, Watson and the other scientists said in a report. "Without additional efforts by all major emitters (of greenhouse gases), the 2C target could be reached even sooner," he told journalists in a phone briefing. The planet has already heated up 1.0 C (1.8 F) above the pre-industrial benchmark, and could see its first year at 1.5 C within a decade, scientists reported at a conference in Oxford last week. The Paris Agreement, inked by 195 nations in December, set an even more ambitious target, vowing to cap warming at "well under" 2C, and even 1.5C if possible. The pact will likely enter into force by the end of year, record speed for an international treaty. Signatories have submitted voluntary national pledges for reducing greenhouse gas emissions. Those pledges, however, are "totally inadequate", the report said. "If governments are serious about trying to achieve even the 2 degree goal, they will have to double and re-double their efforts—now," Watson said. "I think it is fair to say that there is literally no chance of making the 1.5 C target," he added. Urgent steps needed to decarbonise the global economy include improving energy efficiency, switching to renewable energy production, and removal of fossil fuel subsidies, said the report, entitled "The truth about climate change." The co-authors included Carlo Carraro, scientific director of the Fondazione Eni Enrico Mattei in Italy, and vice-chair of one of three IPCC working groups. They also included Nebojsa Nakicenovic, deputy director of the International Institute for Applied Systems Analysis in Vienna and lead author the IPCC working group III. 2015 was the hottest year on record, and 2016 is shaping up to be even warmer, US and European government scientists have forecast. 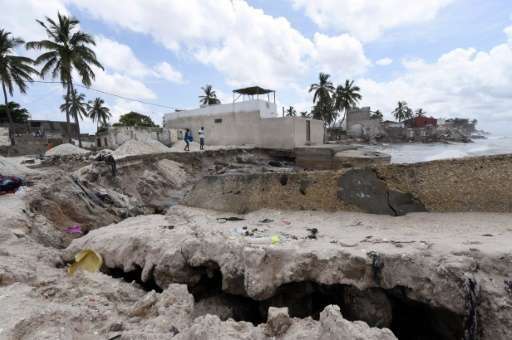 Climate change: Is the 1.5C target a mirage? Science doesn't predict, it proves. Prove it. Let's imagine we raise the temperature of the Earth by 2C. What does this mean? This means that the average energy retained by the surface of the Earth increases proportionally to 2C. On average, all the air is warmed 2C. On average, the surface of the ocean and waters is 2C warmer. By corollary, this means the equilibrium from equator will be dramatically different - it will be much warmer at the equator than the poles. Where dos this energy go? Where can it go? Some of it must go to melting ice, and this can be used as a metric for change. So why is ice melting so dramatically in the North Hemisphere, than the South. Therefor the ice must be an indicator of global change. Global warming proponents have been making predictions for decades, they are batting 0%. Heck, you can't even get the global warming people to even agree on what the average global temperature was on ANY arbitrary day in the past. With all the money they've thrown away at this global warming nonsense, you'd think the least they can come up with is a standard mathematical model that describes global temperatures, let alone predict them.